Nothing causes as much concern for a boater than a fire aboard while underway. Here is what happens in a boat without an automatic engine room extinguisher. Most boat fires start in the confines of the engine room, killing engine and electrical power to the vessel. One or two 2BC extinguishers cannot put out the enclosed fire. The fire then spreads quickly to the rest of the vessel through all the flammables that are readily available, such as the wood trim and foam cushions. Soon the very fiberglass the boat is built from is burning. Ultimately, leaving no alternative but to abandon the vessel. The vessel burns to the waterline. The key to fighting a boat fire is done at the dock before you leave the marina. For boats under 26′ – At least one B-I type approved hand portable fire extinguisher. 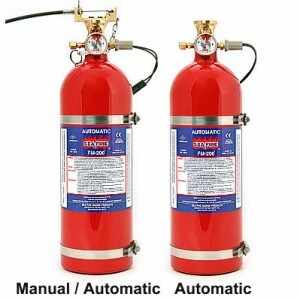 For boats 26′ to 40′ – At least two B-I OR one B-II type approved hand portable fire extinguisher. For boats 40′ to no more than 65′ – At least three B-I OR one B-I plus one B-II type approved hand portable fire extinguisher. Keep in mind that these minimum requirements are exactly that; the absolute minimum. A B-I type extinguisher equals 2 pounds dry chemical. A B-II type extinguisher equals 10 pounds dry chemical. These portable fire extinguishers are also rated to the class of fire they will be able to put out. Class A: Ordinary Combustibles Includes wood, paper, cushions, canvas, fiberglass, rubber, many plastics, and other materials that burn easily and account for many boat fires. These can be extinguished with water. Class B: Flammable Liquids Includes gasoline, propane, diesel fuel, oils, grease, paints, tars, lacquers, and flammable gases. Class C: Energized Electrical Equipment Includes wiring, fuel hoses, circuit breakers, machinery, and appliances. You will likely be using an approved BC Class (although it may be ACB) extinguisher. Using a portable dry chemical extinguisher will allow you to fight a fire ONLY if it is in the first couple minutes of a burn and you can spray the extinguisher at the base of the fire; after that, you are using the extinguisher to fight the fire as you exit the vessel. A portable fire extinguisher should be kept handy between the galley and the exit and a second one near the engine room. Now for the engine room. Because of it’s caustic, noxious agent, discharging a dry chemical extinguisher into a fire may cause damage or even destroy the items that you are trying to protect. There is a superior, modern extinguisher medium (agent) called FM-200. This unique product leaves no residue and is safe to discharged near any electrical or mechanical equipment. FM-200 is even safe enough for discharge in occupied spaces! FM-200 systems reach extinguishing levels in 10 seconds or less, stopping ordinary combustible, electrical, and flammable liquid fires before they cause significant damage. For use in enclosed spaces like an engine room, there are two operation modes available for Sea-Fire FM200 systems; automatic and manual / automatic models. A Sea-Fire automatic extinguisher is activated by the attached temperature sensor valve. Discharge will occur when the sensor valve temperature rises to the system activation point as shown in the specification table and on the label attached to each unit. The manual / automatic offer the ability to lead a manual discharge cable to a position outside the enclosed compartment (often the helm station) so that the extinguisher may be operated remotely. If an automatic / manual extinguisher is not activated manually, it will work as a normal automatic model and discharge when the system activation point is reached. Sea-Fire manufactures FM-200 FD Series manual and automatic fire extinguishers for areas as small as 175 cubic feet and up to 1500 cubic feet. The Sea-Fire FG Series are made to fit small engine rooms an other closed areas, from 25 to 240 cubic feet. Sea-Fire also manufactures the FT Series which are supplied with long, flexible narrow tubing that can reach into hard to access areas; such as the backside of electrical panels for spaces from 25-150 cubic feet. In summary, dry chemical fire extinguishers are fine for trying to put out a fire on the stove, heater or open area. Sea-Fire FM-200 extinguishers are useful in enclosed spaces, occupied spaces and hard to reach spaces.